Save money on checked luggage with these simple hacks for fitting everything you need into a carry on. Snag an amazing deal on a flight for the holidays? Better read that fine print before you start packing. According to a recent report by Hopper, airlines are increasingly unbundling their offerings so that they can offer the lowest possible fares. Which means that once you get to the check-in counter, you’ll likely find yourself shelling out more cash for things that were once included in the base price of your ticket — like a checked bag. In fact, travelers who check at least one bag when flying domestically are paying more overall than they did before airlines began unbundling fares in 2008 and charging separately for checked baggage, according to the Government Accountability Office. Today, checking a bag can set you back an additional $25-$100 depending on the airline you’re flying with. And airlines are raking it in: In 2017, airlines made almost $4.6 billion in revenue on checked baggage fees, according to Department of Transportation statistics. One person not contributing to that revenue? Patrice J. Williams, on-air style expert, blogger and author of Looking Fly on a Dime, who says she’s never checked a bag. Fitting everything you need into a bag that is 9” x 14” x 22” may seem an impossible feat, but Williams is sharing all of her insider tricks for maximizing space and packing more efficiently. Occupy dead space: “Shoes can take up a lot of space, but the ‘dead space’ of the inside of a shoe is prime packing space,” says Williams. “Stuff the inside of a sneaker with socks, underwear, medication or even electronic chargers. If you feel weird about stuffing your clean clothes or items inside of a shoe, just wrap the items in plastic wrap or a plastic baggie." This is a great tip to keep in mind during the winter season when we tend to wear bulkier shoes like boots that take up precious space. Stuffing them not only utilizes the dead space, but helps tall boots keep their shape in the suitcase, says Williams. "The same goes for hats, which are tricky to travel with. Stuff the inside of the hat with clothes. This maximizes your space but also ensures the hat doesn't lose its shape,” she adds. Use the 'bookend' method: Once you roll bulky items like sweaters and jeans, Williams suggests using them as bookends by placing them on either side of the suitcase, and then filling the space in between with smaller articles of clothing. She also recommends utilizing travel bands to keep those bulky items rolled as tight as possible during transit. Another affordable space-saver? Compression storage bags, which are great for packing thick shirts, sweaters, and jackets in the most compact space possible. We’ve all been guilty of shoving way too many clothes in our suitcase — and only wearing half of them on our trip. Luckily Williams has a few tricks up her sleeve for cutting down on the amount of clothing you bring, without limiting your outfit options. Have a color scheme. “It's easier to mix and match your wardrobe (one top with two different pairs of jeans or shorts, etc.) if you follow a cohesive color scheme,” says Williams. “You don't have to wear all neutrals, but even just having one cohesive color makes it easy to play around with mixing and matching. And adding fun statement accessories is a way to create a new look, even if you're wearing the same pieces.” It may take a little pre-planning but when you’re able to remix a single piece multiple ways you can cut down on how many clothes you need to bring, plus it will make choosing an outfit and getting dressed easier during the trip. Pack based on activities, not length of trip. A 10-day trip means 10 different outfits right? Wrong. “I like to break the wardrobe basics down based on activities (because this can mean multiple changes throughout the day) versus strictly the number of days you'll be somewhere,” says Williams. “So if it's a five-day beach getaway where you'll be mostly relaxing, but going out at night once or twice, that might mean: 3 swimsuits, 2 dresses, 3 tops and 2 pairs of shorts; 1 pair of dressy sandals, 1 pair of flats, jewelry. 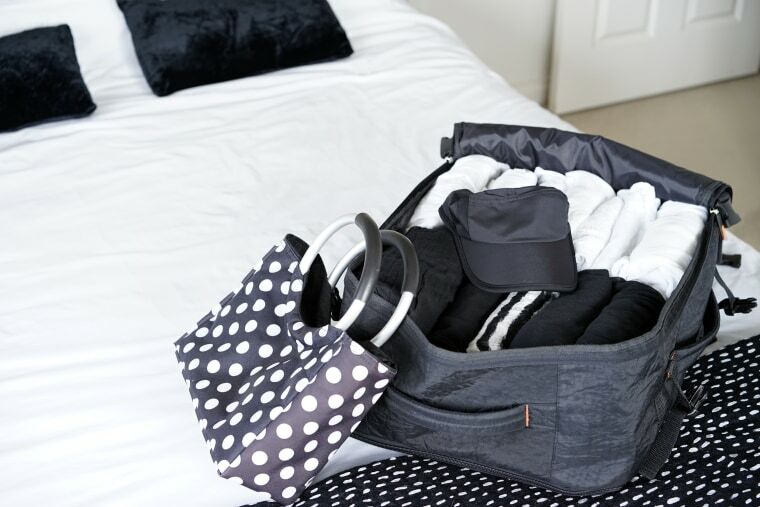 This covers the casualness of a day on the beach and sightseeing, with the dressier options for having fun at night.” Not to mention it all fits into that small carry-on, no problem. Take advantage of sample size beauty. “I like to save all the sample beauty products I get (from department stores, gifts, etc.) and bring them on a trip. This is easier than transferring your favorite items into travel size bottles (which I also do),” says Williams. “And for beauty products that I don't need a lot of (typically eye or night cream), I store them in contact lens cases. Just a few dollops of the product is stored in the cases and because they're a thicker consistency (versus a liquid), I don't worry about them spilling.”If you don't have sample sized beauty items at home, Amazon has a sample program where Prime members can try beauty (as well as home and food) samples for $2. Keep small jewelry items secure. Packing rings, earrings or cuff links? Using pill cases to store them is a great, compact way to keep them secure, says Williams. Untangle your chargers. Williams recommends using a sunglasses case to store your chargers. This keeps them contained and easy to find in your bag. Want to really up your carry-on game? This model from Away Travel passes the 22" x 14" x 9 test, and also comes with a built-in battery plus USB charger for your cell phone, two compartments — one for clothes and one for shoes and toiletries — and a durable outer shell that won’t break no matter how rough the airline is with your luggage. Once you've returned from a trip, Williams recommends going through your bag and noting everything you didn't wear and which products you didn't use. This gives you a snapshot of what you don't need to pack for your next trip, she says. You'll have even more room for souvenirs in your carry-on next time around.